Transitions between two input clips using animated rays. The clips dissolve into each other, and rays are added to the result. The rays ramp up and down over the duration of the effect. The rays animate by moving the origin of the rays across the screen along a line. The Dissolve Amt parameter should be animated to control the transition speed. Rays Center: X & Y, Default: [0 0], Range: any. 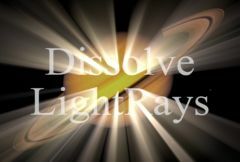 Dissolve are generated from locations in the source clip that are brighter than this value. A value of 0.9 causes dissolve at only the brightest spots. A value of 0 causes dissolve for every non-black area. Use Source Chroma: Default: 1, Range: 0 or greater. If this is 1, the chroma of the Source input affects the chroma of the resulting rays. If it is 0, only the brightness of the Source input affects the brightness of the rays, and the rendering speed should also be faster. Values between 0 and 1 interpolate between these two options. This can be used to raise the threshold on a specific color and thereby reduce the dissolve generated on areas of the source clip containing that color.